In this Oct. 5, 2001 file photo, lobster trays sit ready to be served at the Port Of Los Angeles Lobster Festival in San Pedro, Calif. If rising temperatures have you dreaming about that first lobster roll of the season, be prepared to get sticker shocked. 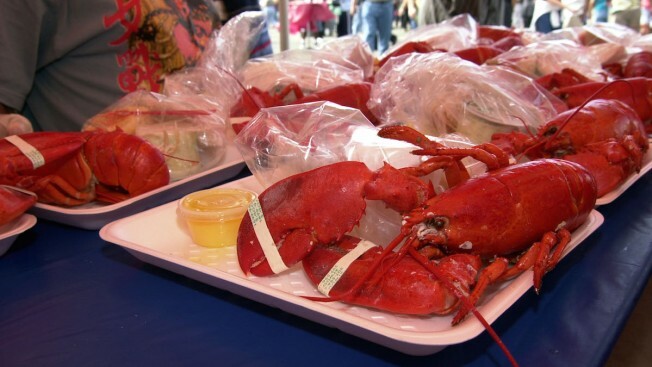 The price of lobster has surged over the past few months as Maine, the state the dominates the U.S. lobster haul, saw the catch fall due to a long winter and chilly spring while global demand remains on the rise, according to The Boston Globe. Cold weather in Canada is keeping its fisheries iced over, adding to the shortage. Hard-shell lobster prices have shot up to about $15 a pound, nearly double from last year's $8 a pound. And restaurants looking to buy pre-shucked lobster meat for their rolls can expect to shell out about $40 a pound. The Globe surveyed seafood prices in restaurants around Boston and found the cost of many lobster dishes to be "off the charts," the paper reports. A lobster roll at Chef Chris Coombs’ restaurant Deuxave will set you back $49, instead of the usual $22. And another area restaurateur told the Globe that it currently costs $47 to prepare his lobster rolls, but has kept the menu price at $29. The New England Aquarium added a rare yellow lobster to its collection of uniquely colored lobsters. The odds of a yellow lobster in the wild are estimated at one in 30 million. Meanwhile, some restaurants have taken lobster off their menus altogether while others have resorted to asking employees to shuck lobsters in-house to help cut costs, according to the Globe. But lobster lovers on a budget won't have to wait until next season to buy their favorite crustacean dish at an affordable price. Once temperatures rise and fisheries open up, prices are expected to come back down.